Oklahoma City Public Schools has thrown open the cafeteria doors and taking lunchtime to the streets. We are revving things up with a new kind of meals on wheels. Lunch is going to a whole new level of health and creativity. The food truck will offer students a different menu to what is served in the cafeteria. All meals meet healthy nutrition standards and are no charge to students. The District’s Executive Chef, Robin L. Obert, and her team are hard at work to make the food truck a success! In addition to rotating among the District’s high schools, the truck will also visit elementary schools for special events. It will also serve as a student learning lab for the Food and Consumer Science program. In the summers, the food truck will serve fresh made meals to children in various communities. We have BIG PLANS for the food truck, stay tuned. 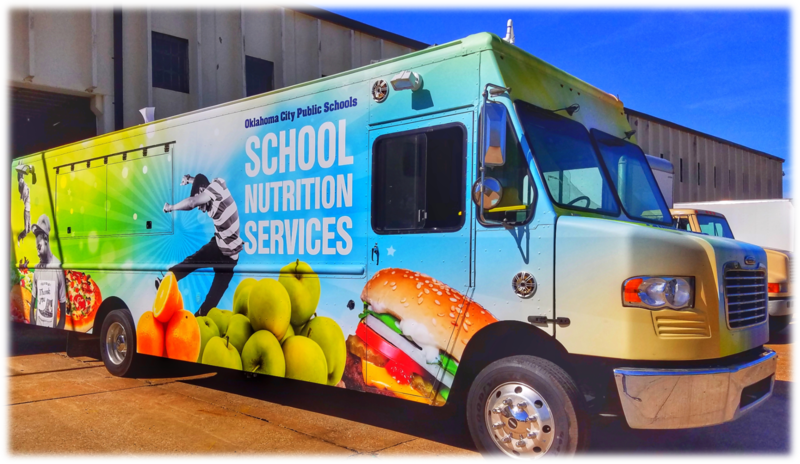 Click on the links below for learn about menu options and when the food truck will be at your school! If you are interested in having the food truck at your school event please fill out the following Food Truck Request Form and email it to Robin O'bert at rlobert@ockps.org.